People say variety is the spice of life, but sometimes, having too many options isn't good, especially when you're presented with an array of delicious food. It's like being forced to name a favorite child: They all have their own unique attributes, and you can't help but love them all equally. What do you get when you add up the donut and the croissant, AKA two of the best pastries known to mankind? Answer: the Cronut, a fried ring of flaky, crumbly, golden brown deliciousness. It's so delicious, people would queue at the NYC bakery where it was invented before the crack of dawn just for a taste of the goods. Torn between fried chicken and pizza? You'll never have to choose again with the Chizza, which brilliantly adds classic pizza toppings to a perfectly fried chicken fillet. Yum! The Hamdog—basically a hotdog running through hamburger patty—is so ingenious, we can't help but wonder why it took mankind such a decades to come up with it. Sure, it looks silly, but it sure makes picking a sandwich a whole lot better! This marriage between a brownie and a cookie is the sweetest wedding we've ever had the pleasure of experiencing. Like yin and yang, ebony and ivory: every bite of this baked chocolatey concoction delivers a burst of with scrumptiously luscious harmony. 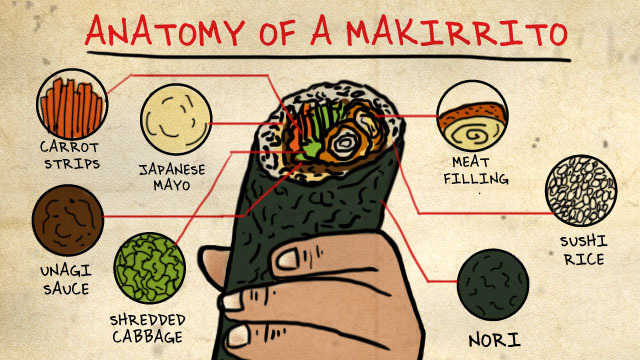 The love child of a maki and a burrito, the Makirrito is Tokyo Tokyo's newest offering. 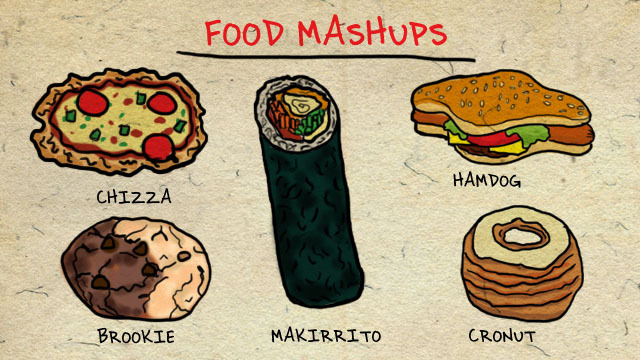 The two available variants, Samurai Karaage and California Kani Tempura, offer all the umami goodness of your go-to maki, combined with your favorite burrito's portability and heft. It's filling and tasty: the perfect complete meal for the millennial on the go. Let's study it further, shall we? Your Makirrito will have either Chicken Karaage or Kani Tempura pieces, along with carrot strips and shredded cabbage. They're drizzled with Japanese mayo and umami sauce, set on a cushy bed of sushi rice, and rolled up in a savory nori blanket. Both Makirrito variants are available at all Tokyo Tokyo branches nationwide at the introductory price of P100, making it the perfect tummy-filler for those extra hectic days. Order one (or both, we won't judge!) for a quick, handy meal! This article was created by Summit Storylabs in partnership with Tokyo Tokyo.